Discussion in 'X and Y' started by May, Jul 11, 2013. 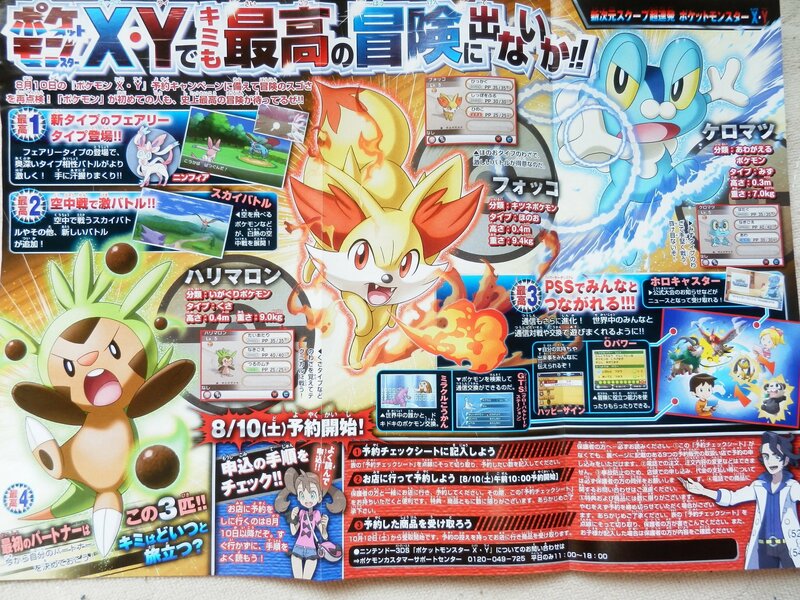 CoroCoro of August is out!! 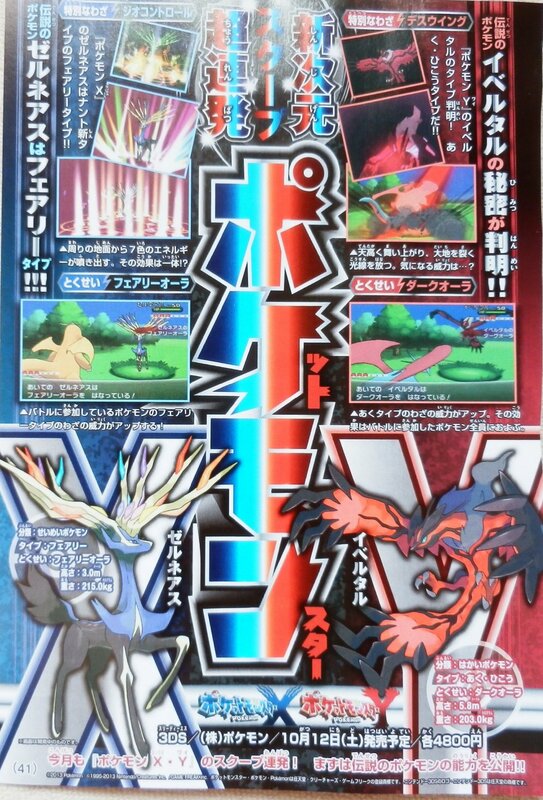 In this issue this time revealed the type of Xerneas and Yveltal, the new professor and some new Pokémon!! Xerneas is a Fairy type and has an ability called "Fairy Aura" (which power-up Fairy moves) and Yveltal is a Dark/Flying Pokémon and has an ability called called "Dark Aura" (which power-up Dark moves). 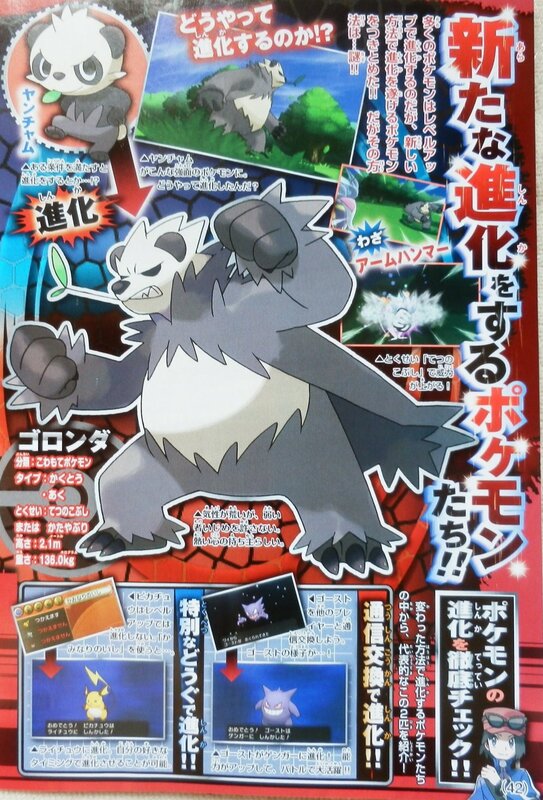 Here we have the evolution of Pancham: Goronda (コロンダ). This Pokémon is a Dark/Fight type. Goronda has an ability called Iron Fist and a move called Hammer Arm. He has a new metod of evolution. 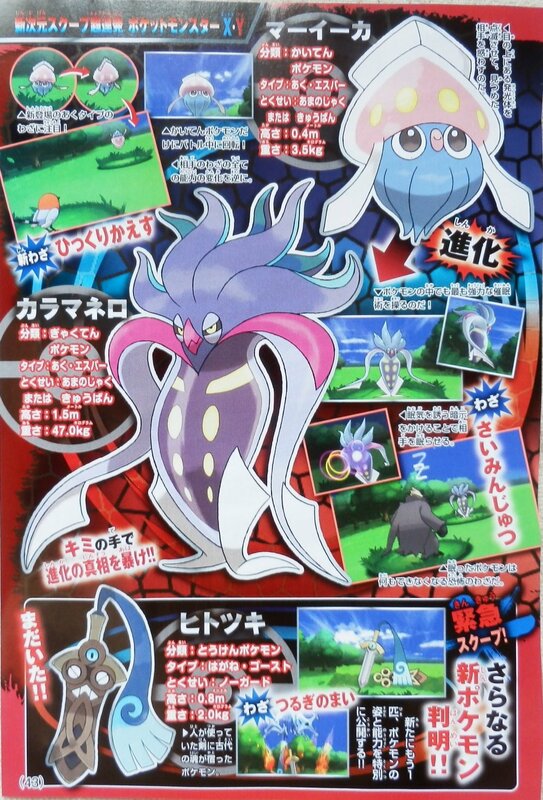 The squid is Maika (マーイーカ) and is a Dark/Psychic type. He know a move called Turn Over which reverses stat changes. His evolution is know as Karamanero (カラマネロ) and like the pre-evolution, is a Dark/Psychic. He know the move Hypnosis. Honedge will have an ability called No Guard. 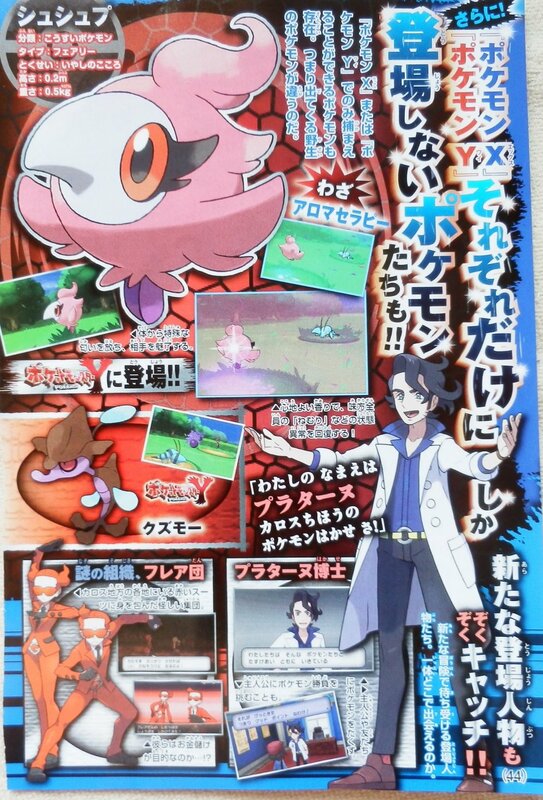 The pink one Shushup (シュシュップ) and is another new Fairy Pokémon. His ability is Healer and know the move AromaTherapy. This Pokémon is exclusive for Pokémon Y.
here we can see the new professor, his name is Purataanu (プラターヌ) and sometime will battle you. The new evil team is Team Flair/Flare (フレア団) and this time this team is only interested in money! Skrelp is exclusive to Pokémon Y. 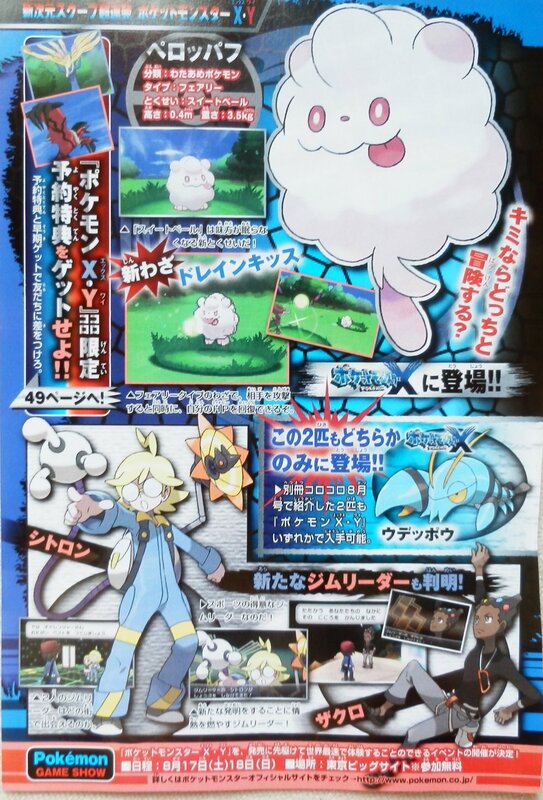 This new Pokémon is Peroppafu ( ペロッパフ) and is a Fairy type. He has a new ability called Sweet Pale (which prevents your allies from falling asleep) and a new move called Drain Kiss. This Pokémon is exclusive for Pokémon X. The two guys are two new gym leaders, the blonde guy is Shitoron (シトロン) and the other is Zakuro (ザクロ). Clauncher is exclusive to Pokémon X. In Japan, if you pre-order the game, you will have an action figure of Xerneas or Yveltal!! These PokéPla are 10cm high and you will receive Xerneas is you pre-order Pokémon X and Yveltal if you pre-order Pokémon Y. If some new information will be released, we will inform you! !